For this project I was asked to find a local independent movie theatre or art gallery and redesign their existing website based on their target audience. I chose to research Movies of Lake Worth. Movies of Lake Worth is a small art and independent theatre with two locations in Lake Worth and Delray, Florida. The theatre has been open for almost 20 years and shows art and foreign independent films and also modern films. They also offer movie camps for students and theatre rentals for parties. There are six large screens with Dolby Digital surround sound and reclining seats with plenty of leg room for the audience. The majority of the audience are in the retirement age. There is a small percentage of younger age groups, especially with the movie camps. The website is responsive, user friendly for easier access for older generations, offer checkout feature for ticket purchases, calendar for camp and party reservations, promote showtimes for art, foreign, independent and modern films, and provide information on current events, hours, and specials. 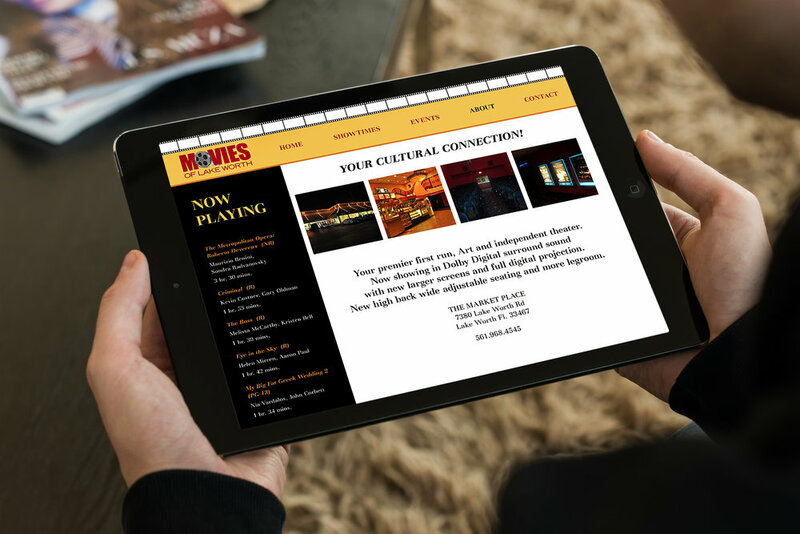 For this project I was asked to find a local independent movie theater or art gallery and redesign their existing website based on their target audience. I chose to research Movies of Lake Worth. Movies of Lake Worth is a small art and independent theater with two locations in Lake Worth and Delray, Florida. The theater has been open for almost 20 years and shows art and foreign independent films and also modern films. They also offer movie camps for students and theater rentals for parties. There are six large screens with Dolby Digital surround sound and reclining seats with plenty of leg room for the audience. The majority of the audience are in the retirement age. There is a small percentage of younger age groups, especially with the movie camps.